Grey House Publishing Canada respects the privacy of personal information that You may provide on this website. Grey House Publishing Canada has controls in place to restrict access to this personal information, according to job requirements and a need to know basis. Grey House Publishing Canada collects, maintains and uses the personal information You provide on this website to offer its products and services to You and to administer Your user account. In most cases this includes Your name, home and/or business address, telephone number, e-mail address and, if applicable, credit card information (collectively “Your Personal Information”). In other cases, You may voluntarily provide additional information via “non-required” fields. Typically, Grey House Publishing Canada will use Your Personal Information to identify You, to process Your registration for user accounts, to provide requested information about products and services, to fulfill Your requests for products and search results, for customer communication, service and administration, and for analytical purposes. Your Personal Information is also used to help Grey House Publishing Canada analyze the browsing patterns of its users in order to improve the content and design of this website. Grey House Publishing Canada does not collect personal information for commercial marketing. Grey House Publishing Canada reserves the right to use any and all information gathered, including, without limitation, Your Personal Information, to support internal investigations and/or other enforcement proceedings. Your Personal Information is protected by security safeguards appropriate to the sensitivity of the information. Controls are in place to restrict access to Your Personal Information, according to job requirements and a need to know basis. Grey House Publishing Canada’ secure server encrypts Your credit card information so that it cannot be read as the information travels over the Internet. Grey House Publishing Canada will exercise commercially reasonable efforts to ensure that Your credit card information remains confidential, and is available only to personnel who have a need to know such information. Grey House Publishing Canada shares Your Personal Information with third party contracted service providers who are bound by Grey House Publishing Canada’ privacy policies and practices. Grey House Publishing Canada will only further disclose Your Personal Information if authorized by You, or when permitted or required by law. Your Personal Information will not be sold to any third parties. Your Personal Information will be retained only as long as is necessary for the fulfillment of the purposes mentioned above. You have the right and responsibility to verify Your Personal Information and amend it as necessary. You may amend Your Personal Information by clicking on My Account. This website may contain links to other websites over which Grey House Publishing Canada has no control. This privacy statement applies only to those sites which display this privacy statement. You should carefully examine the privacy statements of those other websites. Personal information that You choose to provide to other websites will be subject to the privacy policies of those websites. Similar to other websites, this website utilizes a standard technology called “cookies” and web server logs to collect information about how this website is used. Cookies: This website may distribute a small file to Your computer, called a "cookie". This cookie has a purely technical purpose. It is created only after You have signed into the website and is used to track information between You and the application. No personal information is collected, and the cookie is destroyed as soon as You close Your browser or after one hour of inactivity. The Internet Protocol Address and domain name used. The Internet Protocol Address is a numeric identifier assigned either to Your internet service provider or directly to Your computer. This address can be translated to determine the domain name of Your service provider. This information may be consolidated into group data, which Grey House Publishing Canada may share on an aggregate basis with third party contracted service providers who are bound by Grey House Publishing Canada’ privacy policies and procedures. The information collected automatically is used for purposes such as assessing system performance, improving web services, website management and for website security purposes. Grey House Publishing Canada does not use this information to determine Your identity unless required to do so as part of an internal investigation or other enforcement purpose. Security: For site security purposes and to ensure that this website remains available to all users, Grey House Publishing Canada monitors network traffic to identify unauthorized attempts to upload or change information, or Data and/or the Database, or otherwise cause damage. Unauthorized attempts to upload information or Data or change information, the Database or Data on this website are strictly prohibited and may be punishable. Information collected may be used as part of an internal investigation or other enforcement purpose. Except for these authorized enforcement investigations, no other attempts are made to identify individual users or their usage habits. Any changes to this privacy statement will be promptly communicated on this page. Policy changes will not alter how Grey House Publishing Canada handles previously submitted personal information. 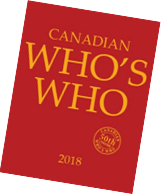 Grey House Publishing Canada collects and maintains the personal biographical information You provide from time to time to publish your biography in Canadian Who's Who. At Your discretion, this information may include but is not limited to Your name, post-nominals, occupation, date and place of birth, parents' names, marital status, spouse or life partner's name, children's names, number of grandchildren, education history, current position, past career positions, career affiliations, volunteer affiliations, titles or description of creative works, awards, honours and honorary degrees, political affiliation, religious affiliation, languages spoken, recreation, clubs, photograph and contact information (“Biographical Information”). From time to time, Canadian Who's Who editors may use public information from reputable sources to update Biographical Information of current biographees or to create biographies of prominent Canadians who may or may not have been involved in the process of submitting information for their own biographies. Grey House Publishing Canada uses this public information to maintain and publish an ongoing record of Canadian life. Grey House Publishing Canada collects Your Biographical Information for commercial purposes relating to the publication of your biography in the publication Canadian Who's Who, a title wholly owned by Grey House Publishing Canada, and distributed by University of Toronto Press. Grey House Publishing Canada makes the Biographical Information in Canadian Who's Who searchable through this web site as Canadian Who's Who Online, also owned by Grey House Publishing Canada. The Biological Information is also available as one of a number of databases that may be accessed by researchers through CharityCAN, a separate website owned and operated by Charter Press Ltd. Access to both of these online editions is by paid subscription only. The Biographical Information is also sold to reference libraries and other providers who may make the information available by membership or subscription. Grey House Publishing Canada does not collect personal information for commercial marketing, and will not sell your contact information to any third party. Grey House Publishing Canada may use Your contact information to contact You with offers to purchase its publications. With Your permission only, Your Biographical Information may be used from time to time in promotional materials created by Charters Press to market Canadian Who's Who to the public. Any Biographical Information that You provide to Grey House Publishing Canada that You wish to keep unpublished will be kept strictly confidential. Editors request contact information (preferably an e-mail address) so that biographees can be contacted on an annual basis or other interval determined by the publisher for the submission of up-to-date information; but if You indicate that this contact information is not to be published, it will not be published in Your biography, either in the print or online edition. Grey House Publishing Canada has controls in place to restrict access to personal information that you do not wish to have published, according to job requirements and a need to know basis. You have the right and responsibility to verify Your Biographical Information and amend it as necessary. You may amend Your Biographical Information through your user account or by contacting an editor at Canadian Who's Who. This website may contain links to other websites over which Grey House Publishing Canada has no control. This privacy statement applies only to those sites which display this privacy statement. You should carefully examine the privacy statements of those other websites. Personal information or Biographical Information that You choose to provide to other websites will be subject to the privacy policies of those websites. This information may be consolidated into group data, which Grey House Publishing Canada may share on an aggregate basis with third party contracted service providers who are bound by Grey House Publishing Canada’ privacy policies and procedures. The information collected automatically is used for purposes such as assessing system performance, improving web services, website management and for website security purposes. Grey House Publishing Canada does not use this information to determine Your identity unless required to do so as part of an internal investigation or other enforcement purpose. Security: For site security purposes and to ensure that this website remains available to all users, Grey House Publishing Canada monitors network traffic to identify unauthorized attempts to upload or change information, or Data and/or the Database, or otherwise cause damage. Unauthorized attempts to upload information or Data or change information, the Database or Data on this website are strictly prohibited and may be punishable. Information collected may be used as part of an internal investigation or other enforcement purpose. Except for these authorized enforcement investigations, no other attempts are made to identify individual users or their usage habits. Grey House Publishing Canada, publishers of Canadian Who’s Who, complies with Canadian anti-spam legislation in effect July 1, 2014. Consent – Consent to receive CEMs is implied where there is an existing business or non-business relationship that includes communicating through electronic messages. Section 66 of the anti-spam law states: A person’s consent to receiving commercial electronic messages from another person is implied until the person gives notification that they no longer consent to receiving such messages from that other person or until three years after the day on which section 6 comes into force, whichever is earlier, if, when that section comes into force, (a) those persons have an existing business relationship or an existing non-business relationship, as defined in subsection 10(10) or (13), respectively, without regard to the period mentioned in that subsection; and (b) the relationship includes the communication between them of commercial electronic messages. Electronic communication between biographees listed in Canadian Who’s Who has been established for a number of years. Renewal of consent will be sought as required by provisions of the law within the next three years. New biographees will be provided with the means of consent as required. Identification – Grey House Publishing Canada, provides company identification information, including employee names, phone number, street/mailing address, web addresses, and e-mail address with every CEM sent. An unsubscribe mechanism – Grey House Publishing Canada, provides a method to unsubscribe at any time from electronic communication with the publisher, outlined in each CEM.